One Step Malaria P.f. / P.v. whole blood antibody Test is a rapid self – performing, test to check the presence of Malaria antibodies in human blood as an aid for in vitro diagnosis of Malaria infection. Malaria remains one of the most serious tropical and subtropical diseases in many countries of the world. It is rampant in most areas of the tropics. Malaria is casued by a parasite that is transmitted from one person to person by the bite of infected Anopheles mosquitoes. There are four kinds of malaria that can infect humans: Malaria also has been reported from blood transfusions or congenitally from mother to child . It is estimated to affect more than 500 million people causing between one and three million deaths every year. The result is shown in the form of bands appearing on the cassette. Presence of two color bands – ( “1” & “c”/ “2” & “C”) or three color bands (“1”, “2” & “C”) indicates positive results, while presence of One band “C” indicates negative result. One Step Pregnancy (HCG) Test- NecSure- It is used for the rapid determination of human chorionic gonadotropin (HCG) in urine. This test is used to obtain a visual qualitative pregnancy result. Human chorionic gonadotropin (HCG) is a glycoprotein hormone secreted by the developing placenta shortly after fertilization. In normal pregnancy HCG can be detected in serum as early as 7 days following conception, doubling every 1.3 to 2 days and reading 100mlu/ml at the first missed menstrual period. The appearance of HCG soon after conception and its subsequent rise in concentration during early gestational growth make it an excellent marker for early detection of pregnancy. A Rapid test for the diagnosis of syphilis to detect antibodies (IgG, IgA and IgM) to Treponema palladium (TP) qualitative in serum or plasma. It is for professional invitro diagnostic use only. The syphilis Ultra rapid test is a rapid chromatographic immunoassay for the qualitative detection of antibodies (IgG, IgA and IgM) to Treponema pallidum (TP) in serum or plasma to aid in the diagnosis of syphilis. Treponema Pallidum (TP) is the causative agent of the venereal disease syphilis. According to the Center for Disease Control (CDC), the number of cases of syphilis infection has markedly increased since 1985. Some key factors that have contributed to this rise include the crack cocaine epidemic and the high incidence of prostitution among drug users. One study reported a substantial epidemiology correlation between the acquisition and transmission of the HIV virus and Syphilis. 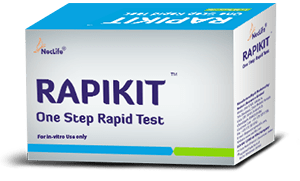 A Rapid, one step test for the qualitative detection of Hepatitis B Surface Antigen (HBs Ag) in serum or plasma.Hepatitis B is transmitted sexually or intravenously and has an incubation period of six months. If not diagnosed properly and in time, it can develop in to acute or chronic infection, liver cirrhosis and fulminant hepatitis. This test is very useful for screening blood donors to find out whether they are HBsAg positive before collection of blood. A rapid, one step test for the qualitative detection of Human Immunodeficiency Virus (HIV) type-1 and/or type-2 in serum or plasma. HIV is the etiologic agent of Acquired Immune Deficiency Syndrome (AIDS). Of all the HIV types, HIV type 1 has been isolated from patients with AIDS and AIDS-related complex, and from healthy people with a high risk for developing AIDS and HIV type 2 has been isolated from West African AIDS patients and from seropositive asymptomatic individuals. Both HIV-1 and -2 elicit immune responses in human. Testing human serum or plasma for the presence of HIV antibodies has proven an effective aid in determining whether an individual has been exposed to HIV and in screening blood products for possible HIV contamination. The HCV One Step Rapid Test is a rapid chromatographic immunoassay for the qualitative detection of antibody to Hepatitis C Virus in serum or plasma. Hepatitis C Virus (HCV) is a small, enveloped, positive-sense, single-stranded RNA Virus. Antibody to HCV is found in over 80% of patients with well-documented non-A, non-B hepatitis. The HCV One Step Rapid Test is a rapid test to qualitatively detect the presence of antibody to HCV in a serum or plasma specimen. The test utilizes a combination of protein A coated particles and recombinant HCV proteins to selectively detect antibody to HCV in serum or plasma. The recombinant HCV proteins used in the test are encoded by the genes for both structural (nucleocapsid) and non-structural proteins. Copyright © NecLife. A leading Pharmaceutical Company.